With a long, long wait for new content from the show, I think it's time to review another old episode. And the episode I've chosen is one of the most divisive of the classic era, possibly one of the most divisive ever. That being Henry's Forest. I reviewed this episode back in 2011 as part of a series 3 overview and... wow, was it terrible. My early reviews were criticised for being incredibly nitpicky. Looking back, the detractors were absolutely right. The episode that suffered the most nitpicky review was this one. It was a shameful piece of work that only focused on Rule 55 and agreed with everything the Rev. Awdry said. And while I do still agree that ignoring railway regulations was bad (in the context of how grounded and faithful episodes were to regulations back then), that's not what makes the episode bad. At all. Rule 55 had been broken before (the most egregious example I can think of is Woolly Bear, where Thomas, Percy and Toby all stopped on the open line at Tidmouth). So that excuse for disliking Henry's Forest does not wash. It should never have washed. I genuinely believe the only reason Awdry brought it up here was due to his own prejudices with Henry, and how problematic the engine was for him. Well, that and it was based on a story he hadn't written. Besides which, if your only focus is being "realistic", you get boring, plot-less husks of stories like The Flying Kipper. Now that that's out of the way, I can focus on why the episode is actually bad. The first of which is that the tone is so consistently sad that it produces one of the most tedious, boring viewing experiences of the entire show. I get it, they wanted to create a melancholic tone. And it worked; as a child, I was sad and emotional while watching it. But as an adult, those emotional scenes have no impact any more. This, admittedly, could be down to watching it multiple times. But I also think that it's because it tries too hard to be sad... and nothing else. The story, narration and music all come together to create an incredibly sombre atmosphere that is completely unique and memorable for the series, and that's great. But it's a double edged sword since... well, it comes out of nowhere. The forest comes from nowhere. Henry's care for it comes from nowhere. And I'm left thinking "why should I care?" If I could compare it to something else, look at Up!. Pixar's wonderful film about fulfilling your dreams is best remembered for two things: Dug the dog and the first ten minutes. That love story is one of the most adorably charming, yet tragic, moments in cinematic history. And the reason it's so well received is that we get to see the characters grow up together. We see them indulge in their hobbies and how much they care for each other. And when Ellie dies, the sadness destroys you. I've seen that multiple times too, and I still get teary watching it. It's a masterclass in storytelling, and it's only ten minutes of a 90 minute film. The rest of it does a brilliant job to produce an uplifting tone mixed with action, drama and humour. And even when it does get emotional again, those moments never go so far as to overshadow the major gut punch at the beginning. Nor do they overstay their welcome in their own right. Granted, Pixar had 90 minutes to work with. But the thing is you can still manage that balance better in only five. Case in point? Edward's Exploit. The reason Edward's act of heroism stands out is because everything else before it is so... normal. The music is peppy, the sun's out, everything seems fine. Yet with one sentence, a change in conditions and a musical cue, you know something's wrong. And after Edward sets off, the narration and music become more triumphant. And while you do get musical changes with Henry's Forest... they're not strong enough to distinguish them from the supposed "uplifting" ditties we hear when we first enter the forest and when the episode ends. The second issue I have is with the theme, and this problem is two fold. First off, if we're applying this to the world the show's set in, the whole thing is counterproductive. Steam engines burn coal, and burning coal emits quite a bit of carbon dioxide. Carbon dioxide emissions damage the planet, including the trees. Ergo, Henry would be doing as much damage to the forest as the storm did. Yes, it's vital that we look after the planet. But it's also important that the themes of a show fit its design. And environmental themes just don't fit Thomas & Friends whatsoever. Never have, never will. My second issue with the theme is that there seems to be a subtle allegory of death and rebirth in it... which is a detrimental lesson for children to learn. Yes, death being a finality is harrowing for preschoolers. Or anyone, for that matter. But a) this show had already killed a character and walled Henry up by this point, and b) if you're not willing to go all the way with the allegory, don't bother with it in the first place. Death is a certainty, and one that kids need to learn as soon as they're able to - if only to deal with it better once a real tragedy strikes. And that, I feel, is where the episode truly slips up. 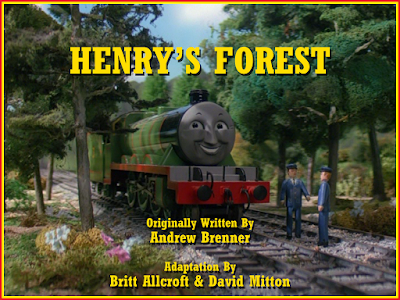 While I agree that the ending is uplifting (or, at least, it's supposed to be), I think learning to accept the death of the forest would've developed Henry's character much better. He'd have come out the other side a stronger engine, which would have led to a beautifully uplifting ending in its own right. There are some episodes that you can watch time and time again and they'll never get old. But this is one that you can only really watch once to feel its effect fully. After that, it becomes a real slog to sit through. It's not completely devoid of good moments: Henry gaining some character that made him stand out from Gordon was great, and Donald doing something away from Douglas is something the show needs to do more often. But the overall tone and theme the episode presents make for a really sad time in all the wrong ways. Another thing to point out: Some steam engines burned WOOD in the past, and in another episode, wood was used to bolster Percy's fire. So another strike against the episode. As a kid, I never understood the Rule 55 controversy...and even now I don't think it matters much. That being said, I think it may have more to do with HOW Henry stopped than anything else. In previous episodes, engines stopped in the yards, where they were supposed to work, like coworkers gathering around a water cooler. This could've been interpreted by the Reverend as someone shirking their duties for something utterly unrelated to your job, like the guy who skips work to do something like say, driving 10 miles away to a nudist beach (Strange comparison, I know). As for the episode itself...I'm wondering if it would have made more impact on a human character rather than an engine, but...the hypocrisy point would still stand, since Railways aren't exactly famous for promoting the environment. As for Henry, he was ultimately envisioned as the 'Grumpy Man of Tidmouth', which is more obvious in Christopher's books. This episode only helped to establish the meek Henry that would run away at the first sign of danger, whereas RS!Henry's arc showed him growing from a hypochondriac to...well, a grumpy old man, but one with gumption. I'm not against meek characters, but surely there must have been some other trait to establish a difference from Gordon and Henry. This may have been another loathsome trait, as it can feel like something of a backtrack for Henry's character. Perhaps if the forest was more of a curiosity rather than an passion, it would've served better. As for stories with nothing else to contrast to, you have a point there. Stories that have nothing but pain and suffering become unwatchable. Even tragedies have moments of levity that just make the hurt come even harder, and this contrast has become a great strength to many shows nowadays, which Thomas has always excelled at, as characters prove their worth.